Team Xbox Latinx was proud to host the 3rd annual Celebrating Latinx in Gaming reception during Game Developers Conference 2018. This year we hosted 300 industry professionals and the event continues to be a place where this vibrant community can come together, network, hear from their peers and celebrate their accomplishments. Watch a short video about one of our community members, Edgar Serrano and find great shots from our event photobooth. This year the event expanded and moved to Minna Gallery near Moscone Center. Featured panels highlighted Latinas in Gaming and the role of Latinx developers in game development. 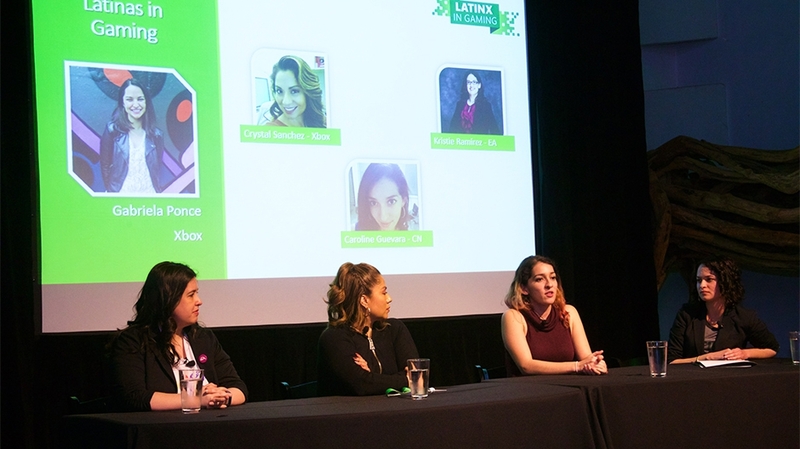 Hosted by Gaby Ponce, a Program Manager at Xbox, the Latinas in Gaming panel was graced by EA’s Kristie Ramirez, Cartoon Network’s Caroline Guevara, and Xbox’s Crystal Sanchez. These women shared their journeys into the game industry, the mentors and role models that pushed them to grow, and how their other passions have influenced their careers. Beyond their own stories, they shed light on the various opportunities our industry has to offer beyond art, design, and engineering, encouraging the audience to pursue what they love and to bring their unique experiences to the gaming community. Next up was the Latinx in Game Development panel , moderated by Arturo Nuñez from Unity. This panel brought up a rich and diverse combination of perspectives from professionals in the gaming industry, who shared their views on the different roles and opportunities for the Latinx community by highlighting what they do and their experience working for companies dedicated to creating, commercializing or providing services for a wide variety of games: Edgar Serrano from Lienzo talked about the influence of the geography in the development of games as an independent studio; Gracie Arenas Strittmatter shared how her stellar career in the industry working in large AAA projects like Anthem and Madden was influenced by the positive role models at home; Daniel Monastero from Garage 227 talked about how his passion for games led him to open an indie studio in Brazil and publish a game on Xbox; Andro Miralrio shared how his different roles in the gaming industry gave him the experience to run operations for a company specializing in providing services for global game publishers. We look forward to hosting this great developer community again next year.